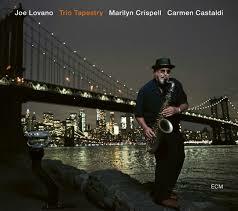 Review: "Lovano, Joe: Trio Tapestry" - Sea of Tranquility - The Web Destination for Progressive Music! Trio Tapestry is the debut outing as a leader on ECM Records for acclaimed New York sax player Joe Lovano, a label he's appeared on many times over the last four decades (Paul Motian, John Abercrombie, Steve Kuhn), but here he's in control and out at the forefront, alongside pianist Marilyn Crispell and drummer Carmen Castaldi. Recorded at New York's Sear Sound Studio in March of 2018, all the compositions were written by Lovano but the entire trio had a hand at all the final arrangements. Much of the material here on Trio Tapestry is moody and atmospheric, the laid back haze of "Seeds of Change" and "Sparkle Lights" ripe with Lovano's smoky lines and Crispell's gorgeous accompaniment, while the haunting "Mystic" sees the leader's melodies searching off in the distance as Castaldi rumbles and clanks with his kit. Great tune. Joe takes a step back on "Piano Drum Episode" and lets his two bandmates take over, and Castaldi digs out his assortment of gongs for, you guessed it, "Gong Episode". For more upbeat fare, there's the gorgeous "Rare Beauty", the complex "Spirit Lake", complete with some intricate piano from Crispell as she flurries under some squonking from Lovano, the melodic "Tarrassa", and the spirited closer "The Smiling Dog", with all three musicians kicking it into overdrive for a slice of frantic and bombastic jazz. I think it's pretty safe to assume that Trio Tapestry will be the first of many albums for Joe Lovano and his trio for ECM judging by what's on display here. Jazz fans, make sure to put this album on your immediate radar. Another standout release from the folks at ECM Records.